How to Apply: Application in duplicate should be typed on A4 paper as per format F-HR-01:01/00 available on our website. Completed applications in duplicate along with the attested copies of certificates in support of qualification, experience, age, caste / PWD and others as per applicability, with recent passport size photographs duly signed and affixed at right upper corner of application should be sent in an envelope SUPERSCRIBING Name of the post applied for and Advt No. 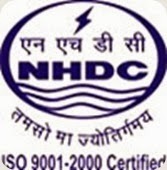 NHDC/HR/RECT-I/2013 to SENIOR MANAGER (HR)-Rectt. NHDC LTD, NHDC PARISAR, SHYAMLA HILLS, BHOPAL (M.P) 462013 latest by 14-02-2014.